There's been some buzzing earlier this month about the new results from the satellite experiment PAMELA who measures the cosmic flux of anti-particles. Nature had a news story which said that positrons in the 10-60 GeV range show a large excess over the background. If the background is correctly estimated (rather unheard of in astrophysics), this could be an indirect sign of dark matter annihilation in our galaxy. The results from PAMELA were flashed during ICHEP and other conferences. However, due to the fact that the collaboration is publishing in Nature, there’s an embargo on releasing the plots in advance of publication. Congratulations to the Nature team for the idea, though they should acknowledge the Chinese government for the inspiration. Thanks to Bob for the news. Update: The story unfolds. Yesterday PAMELA's talk at CERN was "postponed due to Nature embargo". In retaliation, the latest volume of Nature laid out in the TH common room has been stained with coffee. Read also here and here. That's hilarious! Next publishers will be demanding that nobody flash slides, at which point we can all laugh at them for still living in the 20th century. What's that curve entitled "background?". So you can take any data, any model, subtract one from the other and add an excess called "background?". No one told me, I would have written more papers! I've now been told that they have not submitted to Nature, and this bizarreness about reporting their data is self-imposed. This conflicts other people who told me they've submitted to Nature and the Nature embargo policy is the reason for their behavior. I don't know who to believe. But it sure is causing me to not trust the PAMELA results (whatever those actually are). as discussed in section 4.2, the astrophysical background was taken from refs. 29 and 30. Astrophysicists will now try to rethink and improve their computations of the background, including PAMELA data about the B/C ratio. 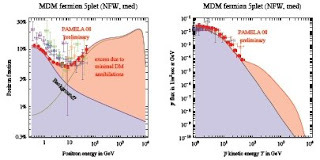 Astrophysical processes considered so far give a positron fraction that decreases with energy, so that it is believed that the higher energy bins are dominated by the DM signal. Does anyone know if there's anything to the rumor that they have a curve that keeps going up all the way to the limits of the device (270 GeV)? Cancellation sounds very odd: for what its worth, here's relevant Nature policy. Presentation and discussion of material submitted to a Nature journal at scientific meetings is encouraged, but authors must indicate that their work is subject to press embargo and decline to discuss it with members of the media...Contributions being prepared for or submitted to a Nature journal can be posted on recognized preprint servers (such as ArXiv or Nature Precedings), and on collaborative websites such as wikis or the author's blog. The website and URL must be identified to the editor in the cover letter accompanying submission of the paper, and the content of the paper must not be advertised to the media by virtue of being on the website or preprint server. Does someone know which camera was used to take the IDM08 conference photo? I was already wondering to buy a digital camera.